Two major central banks have monetary policy meetings in the next 24 hours and while no changes to policy are expected, these currencies are trading firmly ahead of their announcements. The best performer today was the New Zealand dollar, which traded higher against all of the other major currencies. 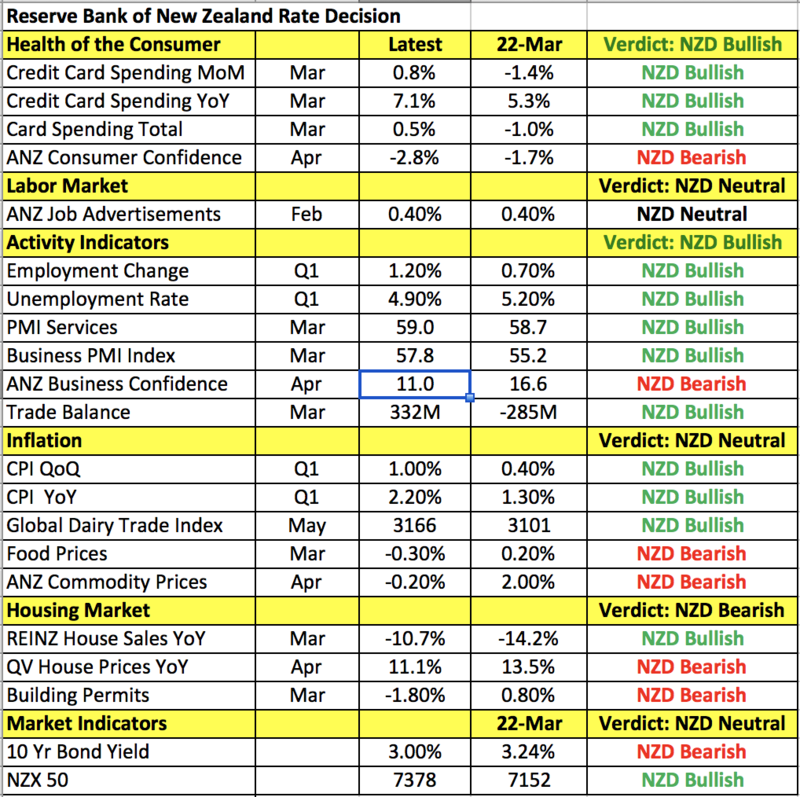 There’s no question that investors are looking for optimism from the central bank especially after the NZ shadow board said the RBNZ should adopt a tightening bias. Taking a look the table below, the Reserve Bank should be satisfied with recent improvements in New Zealand’s economy. Consumer spending is up thanks to a stronger labor market. Inflation and dairy prices are on the rise. Consumer and business confidence weakened but that could turn around as service and manufacturing sector activity continues to improve. The housing market is softer which the RBNZ wants to see. All of this argues for optimism from the Reserve Bank next week and outperformance for NZD. At the last monetary policy meeting, policymakers wanted the currency to fall further and keep monetary policy accommodative but they also recognized that inflation could be rising in the months ahead. At the time, they felt CPI would return to target in the medium term and growth would pick up, which is exactly what we’ve seen over the past 6 weeks. If the RBNZ grows less dovish or better yet starts talking about raising interest rates, NZD/USD will hit 70 cents. However if there are no major changes to the monetary policy statement and RBNZ Governor Wheeler who speaks an hour later is cautious and/or emphasizes the consequences of a strong currency (AUD/NZD is down 3 cents since the last meeting), NZD will drop back below 69 cents. The Canadian and Australian dollars also traded higher today with the loonie rising on the back of stronger oil prices. WTI Crude rose more than 4% intraday and ended the NY session up 3%. It is difficult to say whether USD/CAD has peaked. Technically it certainly appears to be the case and the rise in oil supports a top but fundamentally, the odds are still stacked against the loonie so its best to watch for a clean break of 1.3645, this month’s low before selling USD/CAD. Expectations are also running high for Thursday’s Bank of England monetary policy announcement. 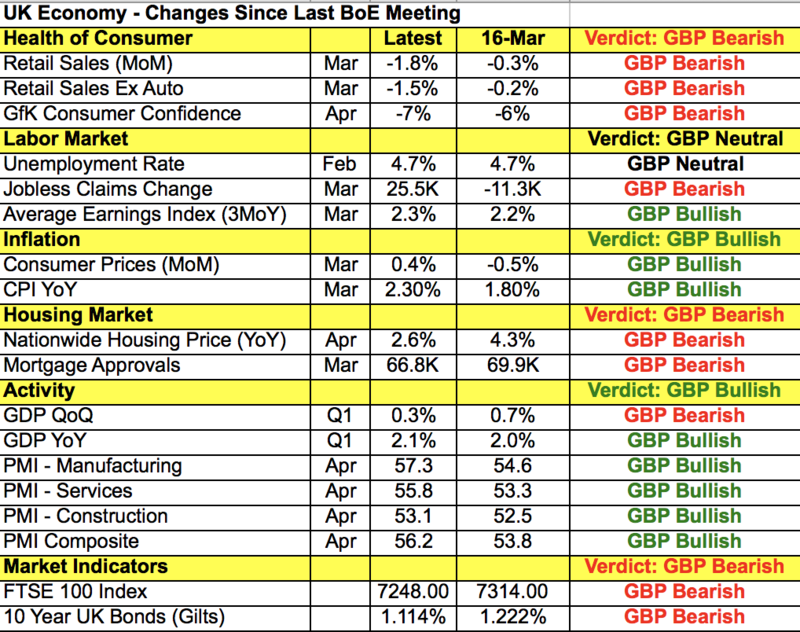 GBP/USD has its eye on 1.3000 and the BoE’s outlook will decide whether that level holds or breaks. Judging from the resilience of sterling, investors are optimistic and there’s even talk of the central bank unwinding stimulus in the fall. Typically when the BoE changes their views, they like to coordinate it with the release of the Quarterly Inflation Report as it includes their latest economic forecasts. Although we recognize the improvements in the economy, we’re not sure enough has changed for the BoE to start talking rate hikes. August when the next report is released may be a better time to change their bias. With that in mind, there’s no doubt that Kristin Forbes, the lone dissenter at the last meeting will vote to raise interest rates again. However it is unlikely that she convinced other policymakers to do the same. Taking a look at the table below, there’s been more improvements than deterioration in the U.K. economy since the last meeting. Inflation and wages are up along with economic activity (per the PMIs) but consumer spending remains very weak and housing activity is slowing. We know that BoE Governor Carney is worried about how the economy will perform under Brexit but so far, the slowdown that he anticipated is not happening. So BoE hawkishness is not a given tomorrow which is why it is best to wait and see what the central bank emphasizes before taking a trade. If they are overwhelmingly positive, emphasizing the need to be vigilant on inflation or more than 1 member dissents, GBP/USD will break 1.30 and hit 1.3050. However if they remain cautious, warn of future risks and downplay recent improvements, GBP/USD will head for 1.2850. Meanwhile investors continued to buy U.S. dollars as yields turned positive. Dollar bulls remained in control with bargain hunters swooping in on dips below 114 in USD/JPY. They were unfazed by geopolitical tensions created by North Korea, the U.S.’ decision to arm Kurdish militants in Syria and the high level personnel changes in Trump’s administration (James Comey). Instead, stronger than expected increases in import and export prices along with hawkish comments from Fed President Rosengren kept the uptrend in the greenback intact. Rosengren said he is worried about the U.S. economy growing too fast and to avoid creating an “over-hot” economy, 3 more rate hikes in 2017 is reasonable. He may not be a voting member of the FOMC this year but talk of 3 instead of 2 more hikes this year is enough to whet the appetites of dollar bulls. USD/JPY has its eye on 115 and is likely to test that level if yields continue to rise. The euro traded lower against the U.S. dollar today on the back of dovish comments from ECB President Draghi. The central bank head killed any expectation for tightening when he said that while the euro area is clearly improving, it is too early to declare success for the economy because wages have not yet responded to the recovery. As a result, the time hasn’t yet come to think about exiting QE. EUR/USD is headed for a test of support at 1.0850 but the real level to watch is 1.0830. If that breaks, EUR/USD could close the gap and fall as low as 1.0750.